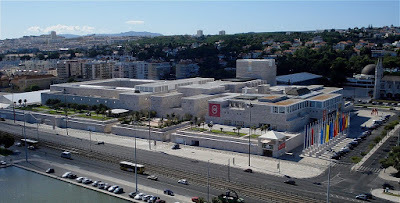 The Belém Cultural Center (CCB - Centro Cultural de Belém) is the largest building with cultural facilities in Portugal. Western Lisbon, 1992. A very impressive Cultural center. Love this place, JM. It would be worth a trip to Portugal just to see it. Great photo, too! It's so big it has its own elevated gardens. Big in any sense: please enlarge the image to appreciate it better! Very nice Theme Day post JM! I remember this beautiful place full of students when I visited Lisbon.It's really BIG! Great post! Well that's big alright! BTW, rumor has it that it's your first birthday around here. If so WhoooHOooo, congratulations for a great year of wonderful photos my friend. Here's to many more! How wonderful to have such a big building just for culture! That's enormous. When you see the tiny cars, it make you realise just how big it is. JM I adore your header. BIG and all culture, that's fantastic! This cultural center is enormous: a real treasure for everyone! I agree with VP, this one should be enlarged. A cultural center this size speaks well of the society which created it. It's huge indeed and lovely modern architecture! In the States this size of a center is dedicated to...shops and stores!! That's big. And attractive, too. Looks like a SUPER BIG cultural center! You could land a 747 in there! My gosh, how many square feet in that building. Absolutely perfect post for today's theme. Imagine having to walk around that place ... it's makig me exhausted just thinking about it. Looks like one of those small scale models that designers have for show what a completed project will look like. Wow, BIG is king! That's another BIG reason to travel to Lisbon. It makes me wonder what you had to climb up to find this gorgeous vantage point. Big and sprawling! Very impressive and enviable! Lisbon is a town of the art. It is very important value tradition.